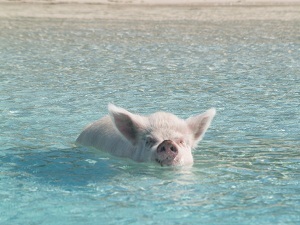 The residents of this island are total porkers! It’s Monday and we are still enjoying our time here in Big Major Spot. Yesterday Brenda and I had an easy day of walking on the beach and wading in shallow water looking for shells. While it’s still windy at 20-25 most days,(did someone say that the Bahamas are windy in January? )we enjoyed doing our beach combing on a windward shore, out of the wind. Given the great popularity of this anchorage(there are over 50 boats in here and room for another 25-50, I expect)the beaches are pretty well picked over. In spite of that we still found some nice little shells. 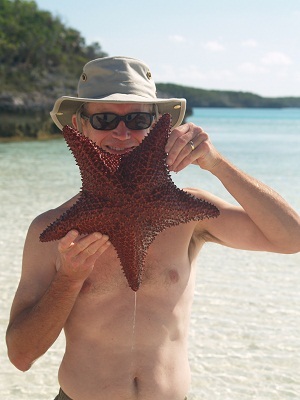 We also came upon a great starfish that was compliant and agreed to pose for a photo as long as we returned him to the water after the shoot. Yes, this color is true, he/she was a brilliant red. Amazing. We also visited with some of the local residents who were wading out into the water hoping for a treat. These pigs are a local attraction and are always happy to visit with anyone offering handouts. These guys are really big, weighing several hundred pounds at least, and certainly couldn’t be convincing stand-ins for the three little pigs that we all know and love. The white one had a particularly cute face, actually the other two were down right ugly, perhaps even pigish, and oinked in a pathetic way when we didn’t come through with the requested offering. I shudder at the thought of what might happen if one of these porkers tried to climb into the dink in their quest for handouts. I felt badly that I didn’t come through yesterday so I’ll head back today with some veggies today. When we returned from the beach to Pandora yesterday I spied a ray swimming slowly along the bottom under the boat. I quickly donned my fins and mask and jumped in with my video camera in hand. I was able to follow him for several hundred feet and got some great shots. Unfortunately, the videos will have to wait till we have big bandwidth so I can load them up. The videos are really fun. Today we plan to visit Thunderball Cave for some snorkeling with some friends. I can’t wait. On Tuesday we plan to head south a short distance, about 5 miles, to Black Point Settlement, one of the larger settlements, a relative term, I am told, in the Exuma chain. 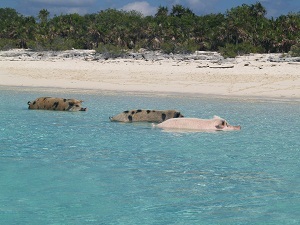 After that we hope to visit Little Farmer’s Cay, a bit further south, for the weekend festival that begins on Friday. This is one of the best events of the winter season and features racing on Bahamas sloops, the local traditional sailing craft as well as special events ashore. We also hope to get our hands on a simcard for the i-pad so that we can use BATELCO, the local phone company,(Bahamas Telephone Company, Get it? )for getting e-mail and posting to our blogs. That will be a lot easier than using the SSB and running the posts through our son Christopher who has been happily handling this for us when we are out of range of wifi. Interestingly, this morning I contacted the Little Farmer’s Yacht Club to reserve a mooring for the festival. I was successful in securing one of only four left. Lucky me!!! My call on the radio set off an avalanche of mooring requests and within ten minutes they were all booked. I guess that “the early bird catches the worm”. Between that and the three little pigs thing, I guess I have tortured the nursery rhyme thing enough for one post. Perhaps I will quit while I am ahead before I lapse into another rhyme. So for now, all I can say is that this little piggy has no interest in running all the way home as I am just having too much fun. I loved Little Farmer’s Cay. But a caution: Dive on your mooring chain — ours broke in the middle of the night. We ended up deploying a Bahamian Anchor in the cut betwen the YC and the Town dock. Also, I gave a plug to your blog on mine. Roger: Your experience is legend and the owner of the club, Roosevelt Nixon, recalls the experience. This is a great spot.